notNeutral BBO2 Outdoor Kids' Table, Recycled Materials (msdsfnnbb2ot) at Pure Design Kids / Tables and Desks / Tables ::: Kids' Toys, Furniture and More at Pure Design Kids! notNeutral has teamed up with Loll DESIGNS of Minnesota to create an OUTDOOR version of the BB2 chair with a new square table, now called BBO2. 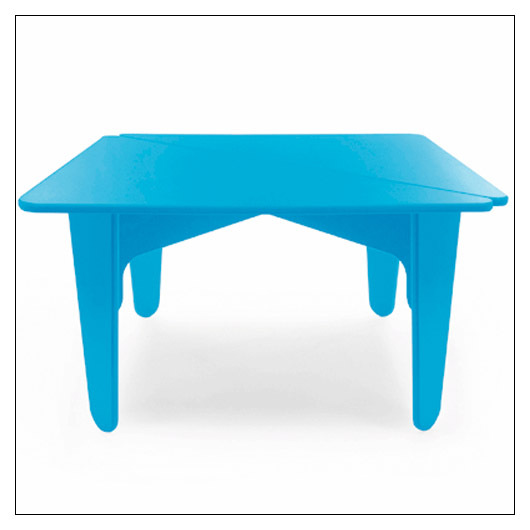 In other words, the long lasting, safe and durable outdoor table for kids! Perfect! Producers of contemporary, durable all-weather furniture, Loll sustainable furniture is fashioned with superior grade recycled high density polyethylene (HDPE). The HDPE Loll uses has an attractive aesthetic and does not have the look of more common recycled material. High grade stainless steel fasteners hold everything together forever. What is 100% recycled post consumer HDPE? It is high density polyethylene, a plastic resin used in products and packaging such as milk jugs, detergent bottles, margarine tubs, and garbage containers. Post consumer HDPE is a material or finished product that has served its intended use and has been diverted or recovered from waste destined for disposal, having completed its life as a consumer item. At the end of its life the furniture can be recycled again. ** Tip: Use indoors and out! The table is 18" high and approx. 34" x 34"